DB2 for z/OS is the database of choice for critical data for many enterprises. It is becoming more and more important to protect this data in case of disaster and to be able to restart with a consistent copy of the DB2 data as quick as possible and with minimal losses. 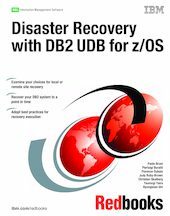 A broad range of functions can be used for the disaster recovery of DB2 subsystems. The traditional DB2 based solution consists of safe keeping and restoring image copies and logs. More general functions, applicable not only to DB2 data, but to the whole system, are hardware related, such as tape vaulting or disk volumes mirroring. Other functions are specific to DB2 such as the Tracker Site. There are also products providing replication capabilities which can be used for specific propagation requirements. DB2 UDB for z/OS Version 8 has introduced two new subsystem wide utilities, BACKUP and RESTORE, which, by interfacing the copy pools functions of DFSMS 1.5, are able to provide Point-In-Time recovery capabilities. The disaster recovery solution consists of the combination of coherent options that best fit in with the requirements, the current environment, and the investment. In this IBM Redbooks publication we first introduce the main concepts, and the primary components for possible solutions. We then describe the most common solutions, and implement several recovery scenarios. All our tests were implemented with DB2 UDB for z/OS Version 8. We also include criteria for choosing a solution, and recommendations based on recovery best practices. We focus on requirements and functions available for a disaster recovery strategy for data stored and managed by DB2 for z/OS. It is worth remembering that the non-DB2 data, logically or physically related to the DB2 applications, should be treated with equivalent and congruent solutions.